When you work with Uncorked Escapes, you travel the world as a VIP! Personal Stylist Consultation - Including a Digital Look Book with 5 outfit suggestions for your trip! Highlights: At the heart of the Swiss Alps, this luxe resort combines Alpine chic and Asian expression so authentically. If you visit during the winter season you can take advantage of their ski butlers! Sips: Take a few moments to relax in their Wine & Cigar Library. Enjoy rare wines only found here & dive into curated literature! Highlights: Known for their tropical grounds and pristine white sand beaches, this secluded, all-inclusive resort is off the coast of Anguilla. They offer beachfront suites, villas, and estate homes on the island! Sips: Their "Sea-To-Table" dinner experience allows you to catch your own entrée and enjoy refreshing drinks while sport fishing! Highlights: Enjoy a plunge pool from every villa at this tropical resort overlooking the coast. Balinese touches are seen all over the property & they offer a private Coconut Grove beach retreat! Sips: Enjoy a taste of Bali with their signature Cooking School. Tour the local markets to select your ingredients & then sip and savor as you create a five-course meal! Highlights: This modern retreat celebrates all things art and wine & keeps you active. Perched high on a hill overlooking a stunning lake, floor-to-ceiling windows offer views of the Andes Mountains and beyond! Sips: Their holistic Wine Spa offers a unique wellness experience utilizing products made from their own vines. The polyphenols from their grape seeds benefit anti-aging & more! Highlights: Set in the beautiful waters of the Indian Ocean, this exclusive hideaway is beyond your wildest dreams. It offers the utmost privacy, luxe settings & plenty of experiences to keep you entertained! Sips: Their ivory-white Tavaru Tower hosts the largest collection of wine in the Maldives. You can enjoy paired tastings as you sip your way around the world! Highlights: This waterside hotel in Puerto Madero captivates you from the moment you walk in. They combine unique art pieces so effortlessly and have nightlife that draws in the whole city! Sips: Rojo Tango is the city's most passionate tango show. Enjoy complimentary beverages while you get lost in El Cabaret! Highlights: Recently restored, this 13th century castle is set on 350 acres of the picturesque shores of Lough Corrib. They have endless activity offerings to enjoy like horseback riding, archery, & falconry. Sips: Enjoy a private dinner & wine tasting in the secret passageways of the castle. Choose from new and old world wine from their cellars while in this remarkable setting! Highlights: This beautifully renovated 19th-century manor home sits high on a hill overlooking the vineyard hills and Douro river. Take in all the sites of this UNESCO region in the lap of luxury! Sips: Embark on a unique wine tasting experience as you cruise from one winery to the next via boat. The river offers a magical way to visit historic wineries in the area! Highlights: As one of the largest private estates in Tuscany, this Ferragamo compound offers a truly authentic experience among the vines. Their culinary offerings will inspire you to move to Italy! Sips: Taste their estate wines under the Tuscan stars. Their astronomer will join you in the Sangiovese vineyards as you sip and see sparkling stars and planets! Highlights: Perfectly situated on the coastline of Oia, this hotel blends modern and authentic touches. Their pool offers stunning views of the Caldera and volcano and there are luxe touches throughout! Sips: The best way to see this beautiful coastline is by boat. Take advantage of their fleet while you sip champagne on the sea! Highlights: Chic and modern, this beachfront retreat offers a new take on luxury. Enjoy views of El Arco & the coastline from every room & enjoy the hip vibes on their rooftop after dark! Sips: Take advantage of their weekly offerings to explore cooking class featuring local recipes & guided tastings of fine wines, microbrews & mescals! Highlights: This stunning hotel & vineyard is less than an hour away from Cape Town. Known as the French Corner of the Cape, this area is known as the food & wine capital of South Africa! Sips: Take their complimentary bicycles for a spin around the property & enjoy a gourmet picnic basket paired with local wines from their 150-year-old cellar! Highlights: Modern luxury overlooking the beautiful Hulopo'e Bay is found on this secluded island of Lana'i. 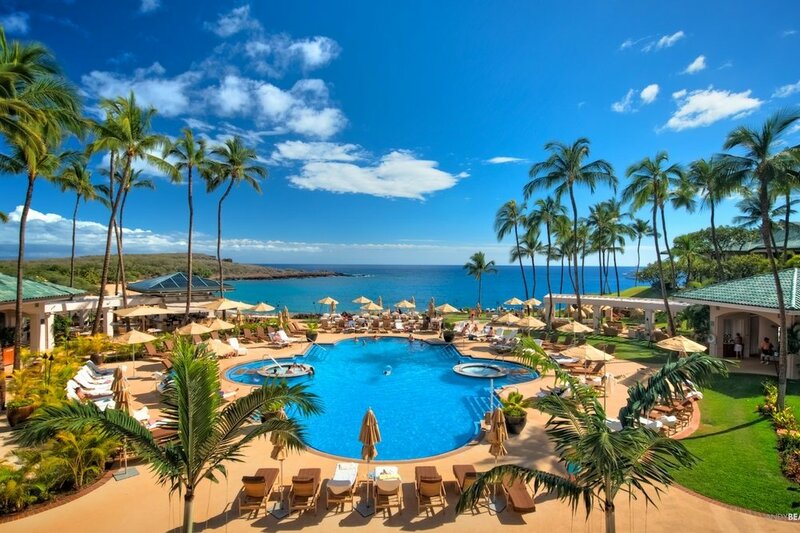 The resort offers a unique Hawaiian experience with lush private hideaways around each and every corner! Sips: Meet with a mixologist at Malibu Farm to design your own cocktail! Use freshly harvested local herbs and vegetables to design your drink & then enjoy an oceanfront dinner! Highlights: Surrounded by vineyards, their charming luxury cottages, suites, and villas feel like home! Their amenities welcome the outdoors and each inviting space makes it hard to leave! Sips: Don't miss the seasonal paired dinner at FARM Restaurant. It's fine dining at it's best with fresh produce straight from their culinary garden and orchards! Highlights: Located in the Hawke's Bay wine region, this resort is set on a 6,500 acre sheep and cattle farm with breathtaking views of the Pacific. These cliffs and coastline are world-renowned! Sips: Seeing the area by helicopter is a must & pairs so well with a romantic picnic on their secluded grounds!